What can you wear that matches a rainstorm? One of the gorgeous handmade umbrellas at Umbrella Heaven, of course. They contain a unique “Double-Dome wind resilience technology” and are handmade in the UK. At just $25 and up, they’re not just lovely to behold, but kind to your wallet, too. According to their bevy of customer testimonials, you’ll be smiling each time the skies turn grey. How’s that for a silver lining? Look at my new vintage bathing suit! That beautiful blue and black polka dotted one-piece from eBay is my newest swimwear. A homemade bikini was actually in the works, because we took the Wardrobe Refashion Pledge. But like most great wardrobe choices, that bathing suit was love at first sight and I had to have it! I haven’t worn a one-piece in years and frankly I didn’t think that a genuine vintage bathing suit would be very comfortable since a lot of them were wool. But I put those concerns aside and decided to be adventurous. I’m so glad I did because not only is this skirted one-piece cuter than any of the bikinis I have been watching, and it’s made of super comfortable cotton. Even better, it was “new old stock” (commonly noted as “NOS” on eBay) so although my Lee Swimplay suit is probably from the 1950′s, I’m still the first one to wear it! If you’re still searching for the perfect swimsuit (or one of many) and want something really unique for summer then you must see the selection of vintage bathing suits on eBay. 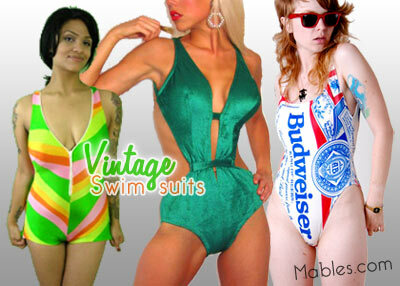 Here are a few of the hottest vintage swimsuits being bid on right now. It surprised me that, almost without exception, one-pieces are the hottest sellers. Despite the popularity of the modern bikini – and I swear it’s not hyperbole to say that nearly everyone in southern California wears one – it seems that a new retro-loving generation is discovering the one-piece. Some truly fantastic maillot swimsuits did come from seasons past; highly styled designer suits of the 40′s and 50′s, the profusely psychedelic prints of the 60s, deep V necklines and bias cuts of the 70s, and uber high cut legs and fluorescent colors of the 80s. Whether you’re a vintage fashionista or a lover of all things retro and ironic, there’s a style for you. Find the perfect retro vintage inspired swimwear on our Vintage Swimsuits page for both women and men! On the Mable’s Vintage Clothing page we list our favorite vintage eBay stores, but every now we just got to feature sellers who stand out from the rest. Enter MakiMaki Vintage: a vintage boutique specializing in one of a kind dresses and other exclusive items. 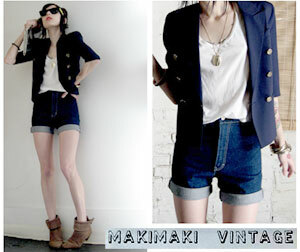 MakiMaki features vintage clothing from the 1950s, mod ’60s, hippy 70s, and radical 80s. Shae, the store owner, used to be a stylist and it shows in her fabulous photos that sets apart MakiMaki from the other vintage clothing sellers on eBay. MakiMaki has been making waves lately in the media and has been featured in VenusZine, Dorian Magazine, as well as on MTV just to name a few. I imagine one of the reasons her store is so popular – besides her great clothing & photos – is the intuitive navigation that categorize by shoes, dresses, jackets, etc. which is a huge plus for an eBay store. Be sure to stay up to date with their latest vintage finds by subscribing to the MakiMaki Vintage blog, or by becoming a friend on MySpace or Facebook. Lucky Magazine just put together a feature called Eco-Friendly Fashion Sourcebook, which introduced me to some new stores and designers. Two of my finds I just have to share. First is Nimli, an online boutique that is “devoted to providing natural, organic, and sustainable lifestyle products while embracing style and aesthetic“. 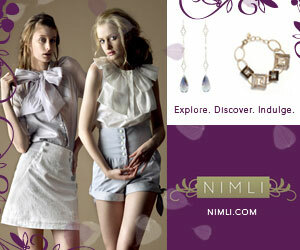 While the fusion of beauty and environmental care is finally becoming the norm in green fashion, Nimli is the first site I’ve seen that does so seamlessly and without making “green” a novelty. The first time I saw the site, it looked so similar to other designer fashion sites that I thought I had clicked the wrong link! Everything looks polished and stylish, but the ubiquitous color green and images of nature are notably absent from their design and graphics. The message seems clear: Nimli does fashion, and being green is just their default. I look forward to the day when environmentally-friendly “options” are presented as the norm and not just a gimmick. Another aspect that helps them stand out among eco-minded retailers is their practice of having each item shipped directly from designer to customer, greatly reducing their carbon footprint, in addition to already buying carbon offset credits. RELATED: For more lovely eco-friendly fashion, be sure to check out our Organic Clothes section. It was only a few days ago we were saying how cool it would be if Threadless reprinted the Staby McKnife design so we could get one. They must have read our minds, because we soon received their newsletter with another opportunity to purchase this friendly knife. W00t for reprints! Also just announced is the 2007 Bestee Award Winners where you can view the designs of the year, best collaboration designs, groundbreaking design of the year, best use of one color, and more. Although our friend Staby McKnife didn’t win any awards, another reprint did win Slogan of the Year. Get it while it’s hot. Vintage furniture is a hot commodity on eBay and one of the most popular searches are for the infamous Eames styled items. Eames designed furniture sets the retro mood in any room decor which is partly why it is such a highly sought after design. Learn more about the Eames brothers’ revolutionary and award winning designs here. Remember to check out our retro furniture page for more decor ideas and our 50′s Clothing store for matching outfits. Find the latest & greatest deals on vintage Eames furniture right now via eBay search. Below is a list of the hottest eBay auctions for Eames furniture. Remember: Buying used items on eBay is another form of recycling and promotes a conscious shopping experience. Stay green! Searching for an easy gift that is unique and stylish? Check out the daily artist submitted designs over at UneeTee. These designer t-shirts don’t cost a lot and they are printed on American Apparel brand shirts for their eco-friendliness and USA manufactured quality. Hot Tip: Make your decision quickly as these t-shirt and hoodie designs sell out quick! My personal pick would be this Amazing Childhood design for it’s brightness and fun outdoor activities. Don’t you wish you could just spend the day on a swing set, or playing freeze tag with your friends? I do. Mable’s: Our Loop NYC page has been updated throughout the years and shows past styles as well as new. Be sure to also check out our unique purses page for more fun styles. Zappos: Get free shipping on your new Loop Design handbag when you purchase from Zappos. 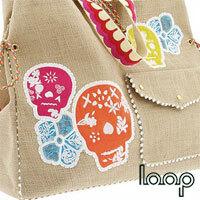 Check out their awesome selection of Loop Design bags now. 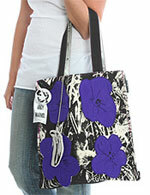 KarmaLoop: One of the best sellers over at KarmaLoop is the Purple Flowers Tote from the Warhol Collection. Be sure to use Coupon Code “STAR” to receive $5 off your purchase of $35 or more. eBay: The auctions below are ending soon, so act fast.